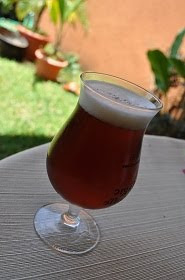 Thirsty Pilgrim: The Top 5 Beers You Can Find in a Place Like Costa Rica, Not Counting Homebrew. The Top 5 Beers You Can Find in a Place Like Costa Rica, Not Counting Homebrew. This might be useful for those who live here or come to visit. (A lot of people come to visit.) It also might be mildly interesting to anyone who likes hypotheticals. If I were stuck there, what would I drink? Let me know if you're surprised at what's available here. I know I have been. Keep in mind that only a very tiny sliver of the population drinks any of these beers. Most of that tiny sliver, I'd wager, corresponds to a small percentage of expats. Nearly everyone else is brand-loyal to a product of Florida Ice and Farm, a.k.a. Cerveceria Costa Rica. That means Imperial, Pilsen, Bavaria, Rock Ice, and even Heineken. 5. Duvel. One of the most overrated beers in history is still pretty good. Physically gorgeous and packed with flavor. Sadly the flavor often becomes downright unpleasant halfway through the glass. Too much alcohol heat to be really drinkable, IMO. But some people go for that. Usual supermarket price: $4.50 for 33 cl. 4. Paulaner Hefeweizen. Just edges out Paulaner Munchner Hell for its surprising compatibility with local food. Think banana-and-clove aroma with fried plantains and gallo pinto with sour cream. Yum. Also works just fine in hot weather. Price: $5 for 50 cl. 3. Samuel Adams Boston Lager. American geeks who turn down their noses at this modern classic need to spend a few weeks in the tropics and then taste it again. It has plenty of character and yet is light enough for the climate. Bonus points for being below 5% abv. Price: $4.50 for 12 oz. 2. North Coast Acme Pale Ale. Only found at the Fresh Market chain, as far as I know. Previously it also carried Red Seal Ale, Scrimshaw Lager, and Pranqster Belgian Ale, but I haven't seen them there lately. Haven't seen Old Rasputin yet, unfortunately. These are the only genuine American craft beers I've seen in Costa Rica (unless you count Sam). Price $4.50 for 12 oz. 1. Guinness Foreign Extra. The most flavorful beer in the Caribbean is likewise in Costa Rica. Just drinkable enough to be dangerous at 7.5% abv. Really nice with parrillada, or anything with grill marks. As far as I'm concerned it has nothing to do with that creamy, gorgeous, bland stuff that comes from the nitro taps. Which are impossible to find here anyway. Price: $3.50 for 12 oz. Pictured: a friend's homebrew, an extract recipe from a ready-made kit, that I'd place above any of these five. I have to say: it isn't The Greatest Beer On Earth, but Duvel is a flavorful, well-crafted beer which ages in fantastic and interesting ways and is very enjoyable if drunk before it is overly warm. It may suffer from over-exposure, but so does Chimay and those beers are still very fine beers, once you over-look the branding, as is Duvel. In my experience Duvel doesn't really age that well -- just depends what you like, I guess -- but when fresh and cold it can impress. It is also a physically gorgeous beer. We could definitely do worse. I was in a Fresh Market several days ago on the way home after work. This particular location had North Coast Acme Pale Ale, Red Seal and Pranqster. I had never tasted any of those before, so I randomly chose Pranqster. Ironic that as a North American ex-pat I had to live in Costa Rica before trying U.S. craft beer. Fresh Market: Pinares. In between the Curridabat Hipermas and La Bomba Galera.